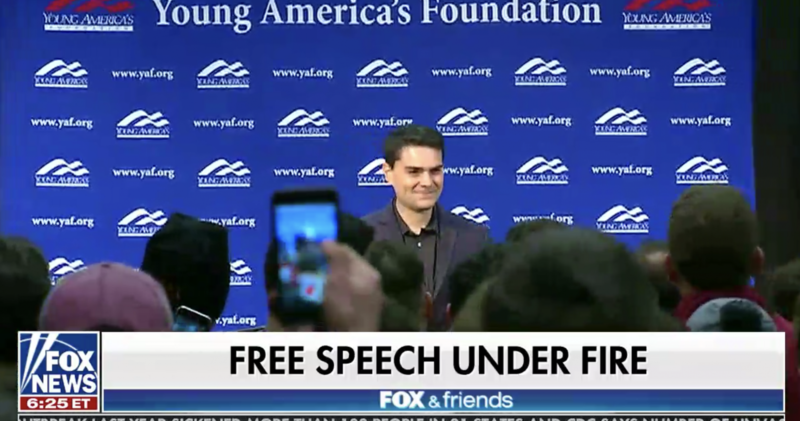 When the Young Americans for Freedom (YAF) chapter at Loyola Marymount University (LMU) in Los Angeles began planning to host Ben Shapiro, the school immediately began throwing up roadblocks. The lecture, part of Young America’s Foundation’s exclusive Fred Allen Lecture Series, would be fast-tracked if a prominent leftist were booked. But because Shapiro is the invited speaker, LMU is putting the YAF chapter through absurd protocols and subjecting the event to ludicrous scrutiny while administrators drag their feet. After a whopping six weeks of waiting, LMU administrators finally notified Young Americans for Freedom leaders that they—before being able to book a venue for Shapiro to speak in—would need to go through “additional review” due to Shapiro’s status as a “notable” speaker. LMU administrators are requiring the YAF chapter to review the school’s “Guiding Principles for Student Activities and Programming” and “respond to the reflective questions.” The YAF chapter’s responses will then determine, during the administrators’ review, whether Shapiro will be allowed to speak on campus. -How will the event planners ensure that the content of the program uplifts the worth and dignity of individuals? -If there are elements of this program that may not respect, or could be perceived to not respect all cultures, how will the organizers ensure that this is not the case? -How will multiple or differing points of view be represented and presented during the program? -How will the event planners ensure that the program does not create a negative on-campus and Westchester community impact? -In what ways does the program offer well-balanced educational content? Setting aside for a moment LMU’s assumption that the YAF chapter can control the minds of all in attendance to “ensure” a single perception, these questions are a ridiculous tool used by LMU administrators to keep conservatives from being heard. -A lecture by Simon Reynolds, a music critic whose Twitter features more conservative bashing than music opinions. Loyola Marymount University needs to stop breathlessly operating as though Shapiro’s appearance on campus poses any sort of danger to its community, or that students who attend the speech will be irreparably damaged. The free and open exchange ideas is the cornerstone of higher learning—LMU would be wise to embrace Shapiro’s presence and thank the Young Americans for Freedom chapter for working to bring a diverse speaker to address its students.